Gates and Kid Stuff Open: 7:00 p.m.
Get ready for another season of East End Fourth Fridays! as DiverseArts Culture Works in collaboration with the East End IBIZ District brings the community block party back for another year to the neighborhood. This year promises to bring new levels of community growth and fun as several local businesses will be offering specials, happy hours and entertainment throughout the day. Throughout the evening, we also invite you to enjoy the various family friendly activities we will have available. Come see the kid-focused entertainment in the Kenny Dorham’s Backyard Kids’ Corner, a special area for kids to play and enjoy the day. Each month, Kids’ Corner will feature arts and crafts, toys, free books from our exchange library, and free pizza for kids(while it lasts!) provided by East Side Pies. The evening promises to have something for everyone, so don’t miss the opportunity to hang out and support your favorite local businesses. For more information and daily updates, check out the East End Fourth Fridays Facebook page, https://www.facebook.com/EastEnd4thFridays, or the DiverseArts website, http://diversearts.org. East End Fourth Fridays! is a programming series produced by DiverseArts Culture Works to help showcase the cultural legacy of East Austin for the benefit of the community. 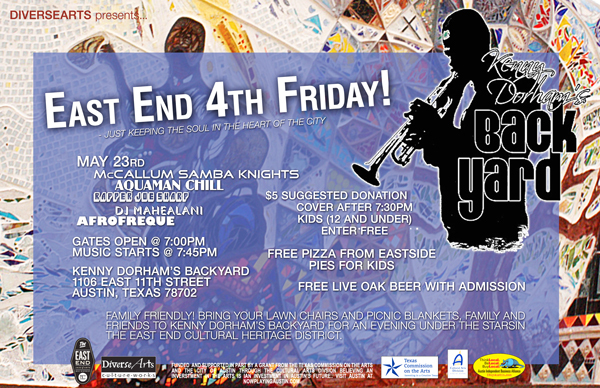 Held every 4th Friday of the month, East End Fourth Fridays! is designed to bring a relaxed, communal, open-air, art and culture block-party to the newly revitalized East End. IBIZ Districts(r) are a program of Austin Independent Business Alliance and are co-sponsored by the City of Austin Economic Development Department. DiverseArts Culture Works is funded and supported in part by the City of Austin through the Economic Growth & Redevelopment Services Office/Cultural Arts Division believing an investment in the Arts is an investment in Austin’s future. Visit Austin at NowPlayingAustin.com.